Being within the catchment area of the highly sought after and `outstanding` Canada Hill Primary School and within a short walk to the adjoining Nature Reserve, this end of terrace house comprises of a kitchen and lounge diner with the addition of a dining conservatory. There are two double bedrooms and a modern bathroom on the first floor. 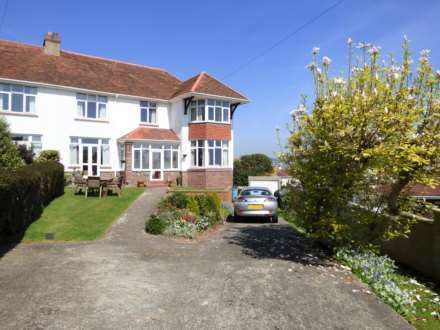 The property enjoys a private rear garden along with two allocated parking spaces. This is an ideal private purchase, however, with rental properties also in high demand, would also be ideally suited for the investor market place. Ogwell is located on the outskirts of Newton Abbot and benefits from a pub, church, village hall and the aforementioned Primary School. There is also a good local bus service. The market town of Newton Abbot is a short distance away with excellent transport links to Exeter, Plymouth and beyond along with a main line train station, thriving high street, schools, leisure facilities and supermarkets. Dartmoor National Park and the South Devon coastline are both within easy striking distance and the nearby nature reserve, village green and Bakers Park offer excellent dog walking facilities. There is also a children`s play park a short walk away off Luxton Road. Textured ceiling, double glazed window to the front aspect. Range of matching base and eye level units with roll edge work tops and tiled surround. Inset four ring gas hob with canopy above and oven below. Inset stainless steel sink with drainer to one side. Space for upright fridge freezer and space and plumbing for washing machine. Wall mounted gas fired boiler supplying the central heating system and providing domestic hot water. Wood effect vinyl flooring. Internal glazed window to conservatory and timber and obscure glazed door to conservatory. Radiator, television aerial point. Wood effect vinyl flooring. Triple aspect room with double glazed windows and double glazed double doors opening out onto the decked area, ideal for alfresco dining. Light and power point and radiator. Textured ceiling and double glazed window to the rear aspect. Radiator and television aerial point. Textured ceiling, double glazed window to the front aspect. Built in overstairs storage cupboard. Radiator. Textured ceiling, obscure double glazed window to the side aspect. Matching white bathroom suite comprising of a low level flush WC, pedestal wash hand basin and panel bath with mixer shower above. Tiling to three walls, ladder style heated towel rail and wood effect vinyl flooring. To the front of the property there is a level garden laid to lawn. There is also a `communal green` which the residents use with a picnic table and path to Canada Hill giving easy access to the primary school. The rear garden comprises of a decked area accessed from the conservatory, ideal for alfresco dining along with a further area of deck and a timber shed. The remainder of the garden is laid to lawn. Courtesy gate to the rear leading to the parking area where there are TWO allocated parking spaces.